More details and spoilers below! 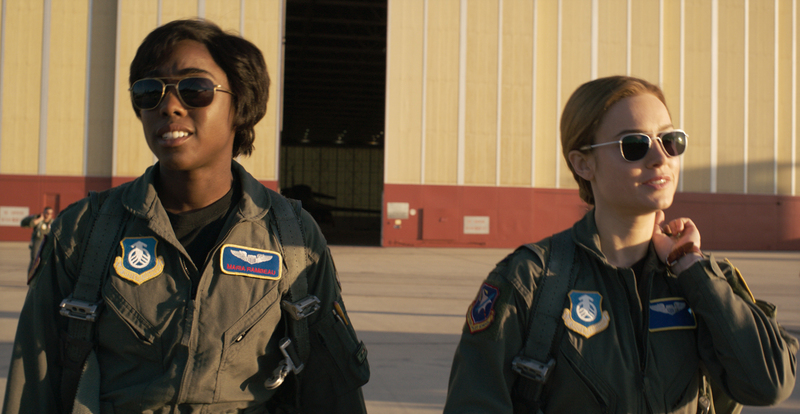 When I heard that Marvel was doing a Carol Danvers Captain Marvel movie, based on Kelly Sue DeConnick’s 2012 series, my biggest hope was that they would put Monica Rambeau, Carol’s friend and another former Captain Marvel, in the movie also because they have such great chemistry (plus one thing the MCU could use is more female friendships). But Captain Marvel did me one better: not only did we have Monica Rambeau, who is the right age to be all grown up and hopefully ready to do some Avenging around the time of Endgame, but we also got her mother Maria Rambeau, who took on the role of Carol’s friend and colleague here. The chemistry and relationships between these three women was the heart of the movie. And the way Monica looked up to Carol reminded me of Kamala Khan, the current Ms. Marvel in the comics. Wouldn’t it be great to see her on the big screen, too? I really think they nailed Carol’s character. Brie Larson did a great job with her smirks and her desire to punch her way out of every problem. I was a big fan of the way they streamlined her origin story, including making Mar-Vell female (as well as Carol’s mentor in the Air Force). It is interesting that in the MCU, Carol’s powers come from an Infinity Stone, the Tesseract or Space Stone. This puts her in the same league as Scarlet Witch as one of the most powerful Avengers. Will Carol also be able to destroy an Infinity Stone? As much as I enjoyed Carol, the screenplay was weak in parts, especially in the Kree sections. Of Carol’s Kree team, only two characters (Yon-Rogg and Minn-Erva) get any character development. I can’t believe they put Djimon Hounsou’s Korath in another movie only to waste him again. And while there was some good humor in the movie, not all of the jokes landed with me. I thought the climactic battle was best once Carol started really using her powers; up until then the action was pretty average. But I have to give bonus points to a younger, looser, Nick Fury and his compatriot Goose. Goose is the real star of the movie. Your review is spot-on! (Only thing I would dispute is the comparison to other Marvel movies; Doctor Strange was of a much higher quality than Ant-Man). Haha, we could argue MCU rankings all day! I think you are right, objectively DS is above Ant-Man in quality, but for me it was very by-the-book while AM had some fresh humor that I really appreciated. I still wouldn’t put DS in the top tier of the MCU. They are both in the middle for me. I’d like to see this movie. I’m glad to hear your assessment. To me, it didn’t add anything new (besides the visual effects, which were great). It didn’t feel particularly current, and we’ve already seen “the arrogant guy dealing with his issues” in the form of Iron Man (and even Star-Lord). That said, I’ve watched it multiple times and it is a very solid movie, just not top tier for me.